Bergmann and Sams believe the real question educators should ask themselves is, "What is the best use of my face-to-face time in class?" Is it to lecture students, or to work with them on actually producing and analyzing their work? The better idea is probably not going to be lecturing. Flipping the class so that students watch lectures at home and do their "homework" in the classroom ensures that the learning doesn't stop at the end of the school day. Sams stressed that one thing he and Bergmann believe about education is that good teaching is about good relationships. Teachers simply cannot build a strong connection with students if they lecture for an hour with their back to the students, facing the whiteboard. Having a flipped classroom allows students to confidently ask questions and interact with their teacher, building connections and improving understanding. One of the major concerns about the flipped classroom structure is that it relies on videos. Bergmann stressed that it's not about the videos; rather, it is about being actively engaged in class and being able to really help students when they need their teachers most. There may be technology barriers; students may not have Internet access or computers at home. Bergmann and Sams suggested sending recorded lectures home on flash drives or DVDs. The digital divide can be overcome; classroom interaction is the key. Bergmann and Sams explained that another concern is, "What if the students don't watch the videos?" Their answer was that there will always be students who don't want to do work at home; however, they are more likely to do this work at home because it’s as easy as watching TV—something they probably do already. Bergmann and Sams showed video examples of students from a school where teachers implemented the flipped classroom model with some of the most struggling students. In the video, the students explained how with this new way of learning, not only have their grades improved drastically, but they now have a desire and excitement to further their education. 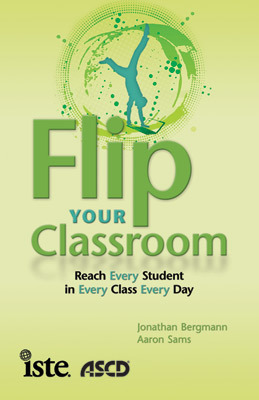 Bergmann and Sams left the audience with a challenge: Try flipping one lesson and see how it goes. Flipping a class will take time; be patient and optimistic. In the end, a more successful classroom is one in which the teacher doesn't talk at the students, but rather engages them.